The Event Promoter: T1000 Pty Limited, ACN 164 475 325. 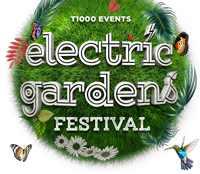 All tickets sold to Electric Gardens 2018 (“the Event“) are sold on the condition that you are bound by these Terms and Conditions of Entry and such other rules, terms or conditions as may be published by the Event Promoter. A current proof of age card. If you are buying a ticket from a friend and your name is not on the ticket you will need to ensure your ticket is reissued through the Eventbrite system in your name. Event wristbands must be worn at all times during the Event and may be inspected at any time. If you do not have a valid event wristband you may be evicted from the Event. These terms and conditions do not exclude, restrict or modify the application of any provision of the Australian Consumer Law (ACL) where to do so would either contravene the ACL or cause any part of these conditions to be void. Where any provision of these terms and conditions is contrary to any binding provision contained in the ACL it must be read down to the minimum extent necessary to achieve its validity or severed from these terms or conditions without invalidating or affecting the remaining provisions of these conditions.